As much as most of my Audible explorations have focused on biographies read by the author, I have started to dabble with some of their genre fiction for television franchises I already love. That's how I ended up with a copy of The X-Files: Cold Cases in my Audible library. I've been a fan of thes how for some time but I had never tried engaging with their supporting fiction in terms of books and such so I wasn't quite sure what to expect here. And I was rarther worried that my knowledge of the show was insufficient to be able to jump into an anthology series like this without further preparation. But the end result was actually a lot of fun and a great celebration of the show. And the fact that this is more a full audio drama than just an audiobook makes for a more entertaining listening experience. Synopsis: The X-Files: Cold Cases is an Audible audibook adaptation of related graphic novels written by Joe Harris. The stories take place after the events of The X-Files: I Want to Believe and reunites us with our heroes pretty much in hiding. The story starts with a startling breach of FBI security. As far-fetched as breaking past their security was, the more interesting revelation was the highly targeted nature of the attack. The breah was specifically directed at pulling up files from the former X-Files program that has been shut down for some time now. Given this, former X-Files boss Walter Skinner reaches out to Fox Mulder and Dana Scully to let them know. These days Fox and Dana are living under different identities in an effort to bury their past lives. The two also had a child but he too has been hidden away under a false identity and kept completely separate from them. But just as the warning goes out that someone is interested in the X-Files, Dana finds herself being pursued by mysterious figures that clearly able to identify her. What I Liked: Hearing the likes of David Duchovny, Gillian Anderson, and Mitch Pileggi reprising their respective roles from the show was amazing and they really just slipped back into character very well. As an audio experience, the book really shows you just how much for the show's impact was through how the characters would say things and the acting talent assembled for this piece really know how to make things feel quite real. There were so many familiar voices involved and it all added to the brilliance of this experience. Couple that with a great story that touches on past episodes in a meaningful way but doesn't allow itself to get overly bogged down in dredging up history or forcing the listener/reader to stop and re-watch the episodes in question in order to appreciate the story. The larger story arc across this book felt very consistent with the show and the acting just made sure the dialog felt fully in tune as well. What Could Have Been Better: Cloning (or the alien equivalent thereof) plays a big role here and it does make for a somewhat lazy excuse for various characters to come back from the dead - the best example of this being the figure fans have long referred to as the Cigarette Smoking Man. To have him back in play and again actively working against our heroes felt like a little too much of the old show dynamic back in play. Some of the middle bits of this story can be a little draggy as they did they to get back to the sort of "freak of the week" format as Mulder and Scully tried to look into different cases, some connected to past adventures. And so despite the very striking start to this whole arc with the hacking incident, the action tapers off a bit until it picks up once more for the finale. It's a natural story structure but one that results in some slowness here and there. 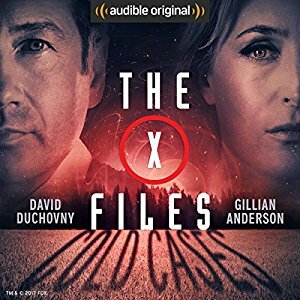 TL;DR: The X-Files: Cold Cases is a fun return to the X-Files world and an audio experience that is beautifully acted out by members of the original cast. It is totally worth a listen through and in some ways may still be better than the recent revival season. Thus the audio book gets 5 aliens of all shapes and sizes out of a possible 5.